Restek President Bryan Wolcott accepting the SelectScience Reviewers’ Choice Award for Analytical Science Company of the Year. PHILADELPHIA — The reviews are in and Restek is on top. According to a news release, leading independent science publisher SelectScience presented Restek with its Reviewers’ Choice Award for Analytical Science Company of the Year, in recognition of the high ratings and positive feedback it received from customers leaving laboratory product reviews on its influential website. The award was presented to Restek President Bryan Wolcott by SelectScience Editor-in-Chief Kerry Parker. “These awards are truly unique within the science industry — the only awards where scientists themselves decide who should win,” Parker said. 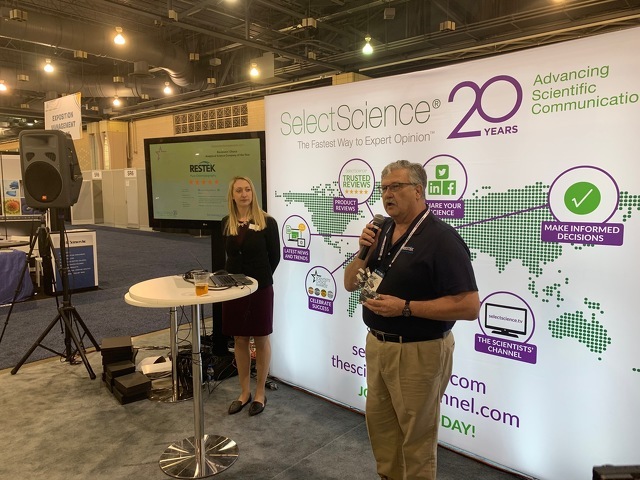 Winners and nominees of the annual Scientists’ Choice Awards were celebrated during a glitzy SelectScience party on March 21 at the Pittcon 2019 International Conference and Expo in Philadelphia. Of the thousands of reviews by users on SelectScience, the award recognized Restek for having the highest average rating in 2018. This is the second award Retek received this year. In January, Global distributor Avantor presented Restek with its Platinum Level Achievement Award for Operational Excellence to recognize Restek’s commitment to enrichment, cooperation, quality assurance and shipping performance.